Nelson Agholor leaps over a defender to score his first of two touchdowns. 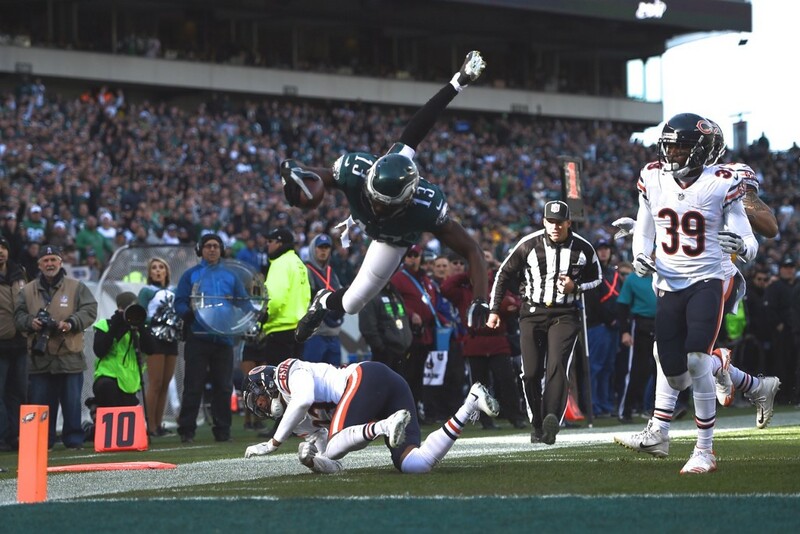 While the Chicago Bears were whiffing on blocks, dropping passes and executing on offense and defense like they were blindfolded, the Eagles (10–1) were going about their business, dancing and celebrating their way to a 31–3 win over the hapless Chicago Bears (3–8) at the Linc. Bears offensive linemen Kyle Long and Bobby Massie seemed to be upset with themselves as much as they were with the Eagles’ many choreographed celebrations that included a simulation where wide receiver Alshon Jeffery — after he scored a touchdown in the first quarter — rolls (he really just dropped it) an imaginary bowling ball at the other 10 offensive players who lined up as pins. The Eagles defense had just handed the Bears one of their worst offensive performances in franchise history, including a total of just six yards rushing on 14 carries for the day … as a team. Massie — like Long — seemed to forget that the NFL relaxed its previous rules prohibiting celebrations and that teams all over the league are doing choreographed celebrations. “They’re doing the same thing the Carolina Panthers did in 2015,” Massie said. After starting the game with a drive that stalled at midfield, the Eagles dominated the Bears in every facet of the game. The first quarter was nothing to write home about. The Bears did nothing on offense. The Eagles scored on an eight-play, 44-yard drive to notch the only points of the quarter when Carson Wentz connected with tight end Zach Ertz for a 17-yard touchdown. The Eagles turned the ball over twice in the first quarter. The first was a LeGarrette Blount drop after a 35-yard run. The other was by safety Malcolm Jenkins who had the ball punched out of his hands after he intercepted Mitchell Trubisky near midfield. The Birds looked more like themselves in the second quarter when they moved the ball up and down the field, scoring two touchdowns and getting a 45-yard field goal from a fully healed Jake Elliott. The first touchdown of the second quarter was a nine-play, 56-yard drive that ended with Wentz hitting Nelson Agholor with a wide receiver screen, then Agholor twisted, turned and leaped his way to a 15-yard score. Agholor talked about the unselfish play of Jeffery that helped set up the score. The second touchdown came with just nine seconds left in the half and the ball on the Chicago eight-yard line. Wentz threw a bullet to the middle of the end zone to Jeffery. The score at intermission was 24–0. The Eagles final touchdown came in the fourth quarter to make the score 24–3. The Eagles drive started from their own 27-yard line at the end of the third quarter and ended with 13:50 left in the fourth when Jay Ajayi slashed 30 yards to the Bears five-yard line where he was stripped of the ball by cornerback Cre’Von LeBlanc. The fumble bounced into the end zone where Agholor grabbed it for the score. The Eagles have registered four consecutive blowouts. Offensive tackle Lane Johnson was asked whether the Eagles were sending a message to the rest of the NFC. The Eagles defense was a force unto itself. No one had more than five total tackles. As a unit, the Birds held the Bears to 153 total yards. Bears running back Jordan Howard entered the game as the NFL’s third leading rusher with 841 yards and five touchdowns. He left the Linc with six net yards and not even a sniff of the end zone. Wentz was 23 of 36 for 227 yards and three touchdown passes. He was sacked once and threw no interceptions. The Eagles as a team rushed for 176 yards on 33 carries. Blount rushed 15 times for 97 yards, Wentz had five carries for 29 yards, Corey Clement recorded 27 yards on four carries and Ajayi five carries for 26 yards. Trubisky finished 17 of 33 for 147 yards, no TDs, two interceptions and was sacked twice. Torrey Smith, who caught four passes for 30 yards, said if Long and Massie are upset about their celebrations, the answer is simple. Don’t let us score. Wentz said he just looks over to see what his guys are doing after a touchdown and goes with the flow.